Fatou Bensouda will be the next Prosecutor of the International Criminal Court. said that at an informal meeting of the 119 countries on Thursday, he will ask that Bensouda be formally elected by the Assembly when it opens its annual meeting at U.N. headquarters on Dec. 12. She would become the second chief prosecutor and the first woman to hold one of the world's top legal posts. Born in Banjul, Gambia, on January 31, 1961, she practiced law as a maritime expert (she holds a master's in International Maritime Law and the Law of the Sea, as well as a law degree earned in Nigeria) and as general manager of a major bank. From 1987 to 2000, she held a number of national posts, including Solicitor General and Minister of Justice of Gambia. Bensouda served as a delegate at U.N. crime prevention conferences, at human rights meetings of the precursor to the African Union, and at meetings of the ICC Preparatory Commission. And she helped to negotiate founding charters of ECOWAS, the 15-member Economic Community of West African States. That experience no doubt has informed missions she's led for the Office of the Prosecutor -- including ones in the West African states of Guinea, which the ICC prosecutor's office is monitoring, and of Côte d'Ivoire (June 2011 video below), whose former President just spent his 1st full night in an ICC jail. 'We say that ICC is targeting Africans, but all of the victims in our cases in Africa are African victims. They are not from another continent. And they're the ones who are suffering these crimes. 'Now if you are telling me that, if we have those referrals from these states, we should say 'we won't go there because they are African states', I am sorry, we will not do that. 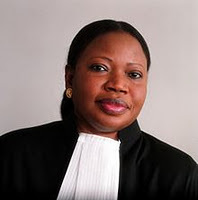 Bensouda's spoken frequently on issues related to international criminal law. Her publications include "Gender and Sexual Violence Under the Rome Statute," in From Human Rights to International Criminal Law: Studies in Honour of an African Jurist, the Late Judge Laïty Kama (2007); "International Criminal Law in an African Context," co-authored with Hassan Jallow, in The African Guide to International Criminal Justice (2008); "Challenges Related to Investigations and Prosecutions at the International Criminal Court," in International Criminal Justice: Law and Practice from The Rome Statute to Its Review (2010); and "The ICC Statute -- An Insider's Perspective on a Sui Generis System for Global Justice," North Carolina Journal of International Law & Commercial Regulation (2011). Looking forward to her tenure as leader of the ICC Office of the Prosecutor.